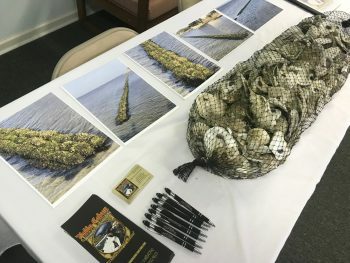 On Aug. 9, the North Carolina Coastal Federation hosted a Living Shorelines Open House. At the open house, waterfront homeowners were invited to learn more about what they could do to prevent shoreline erosion on their property. While some homeowners at the event simply wanted to gain new insight into the work of the federation, the majority of them were there because they’ve been experiencing shoreline erosion on their properties. “In the past 17 years, I have lost about 15 feet of marsh along my shoreline,” explained one homeowner. Another visitor has a bulkhead on her property, but a new boat ramp has increased erosion along her shoreline and the bulkhead is no longer working to prevent it. 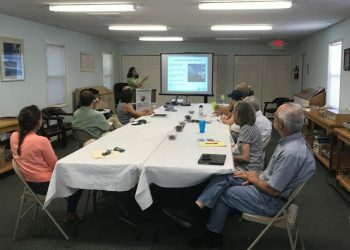 In addition to property owners, the crowd included federation staff members, Dr. Lexia Weaver, coastal scientist, and Rachel Bisesi, coastal educator. The staff members presented on the basics of how living shorelines work. Living shorelines are an erosion control method that can be used in place of a bulkhead or hardened structure on waterfront properties. Living shorelines are primarily constructed by using salt marsh grasses and bags of recycled oyster shells to buffer wave energy. When waves hit bulkheads, the energy bounces back and can cause more erosion to the shoreline in front of it. Living shorelines are able to absorb this wave energy and protect properties from storms because they follow the natural slope of the shoreline and are made with grasses native to the area. After explaining how living shorelines work, Dr. Weaver went into detail about the permitting process and the federation’s plans to try to make it easier for property owners to build living shorelines of their own. 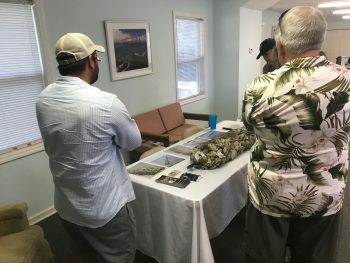 Other members of the open house included Dr. Niels Lindquist of Sandbar Oyster Company and a contractor from Bobby Cahoon Construction, Inc., Derrick Ipock. Bobby Cahoon Construction, Inc. has worked with the federation on previous shoreline projects and Ipock was able to share his experiences and expertise on the effectiveness of living shorelines. “We’ve learned a lot from completing these projects, but I’m still here to learn as much as I can just like everyone else,” Ipock said to the group. Dr. Lindquist shared some startling images of shoreline erosion over the past 10 years along the North Carolina coast and explained how it got to the point it is today. He also spent some time sharing with the audience a new method of creating living shorelines that his company has created. Oyster Catcher™ is a biodegradable substance that attracts juvenile oysters to the material so they can establish habitat and contribute to the living shoreline. After the presentation and a quick lunch, the group was able to see a living shoreline in action at the Sunny Point shorelines on Broad Creek. The federation had installed this living shoreline and wanted to demonstrate the success waterfront homeowners can have by installing their own.